For those outside of the U.S – the Final Four is part of the NCAA (National Collegiate Athletic Association) Division 1 basketball tournament, for both the men’s and the women’s game. The full tournament began in March (March Madness) and ends with the Women’s Game final on Sunday 7th April and the Men’s Final on Monday 8th April 2019. The Final Four is exactly what it says on the tin…the remaining 4 teams in the Tournament. In fact, winning women head coaches make up 24 wins out of 37 (65%) with only 2 different winning male coaches, that being Geno Auriemma (11 wins) and Leon Barmore (1 win). 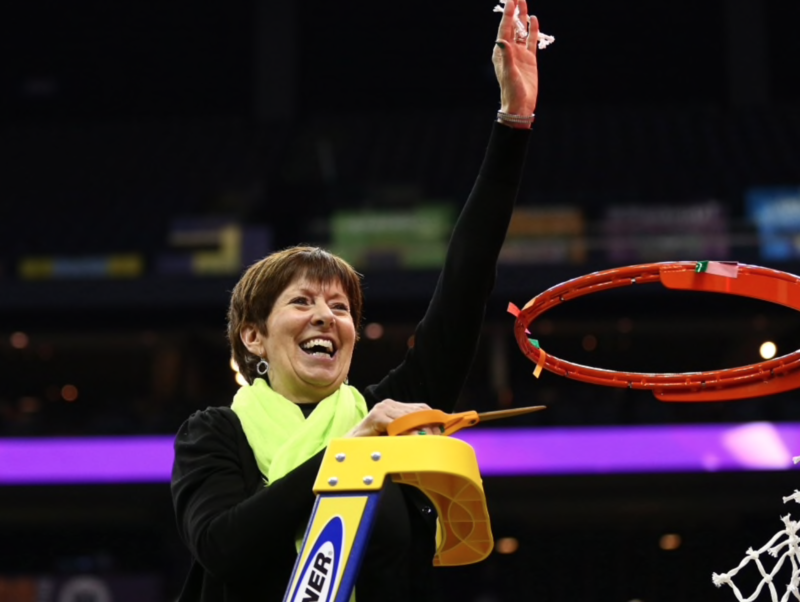 Muffet McGraw, formerly Ann O’Brien (born December 5, 1955) is an American basketball coach, currently the head women’s basketball coach at Notre Dame, where she has compiled a 905–272 (.769) record over 32 seasons. She has led her team to 8 Final Fours (1997, 2001, 2011, 2012, 2013, 2014, 2015 and 2018), and won the National Championship in 2001 and 2018. McGraw has led the Irish to 24 NCAA tournament appearances including a current streak of 22 straight. In the current streak, Notre Dame made it to the second round in all but one of the appearances. McGraw graduated from Saint Joseph’s University and briefly played professionally for the California Dreams of the Women’s Professional Basketball League. McGraw has compiled 50 wins over ranked opponents, including 40 over the last 8 seasons. Her teams appeared in the AP poll 139 times during her tenure. Notre Dame finished in the Top 3 of the Big East in 9 out of the 11 seasons they were in the league and finished in first place in the Atlantic Coast Conference in all 4 seasons since they entered the conference. Notre Dame also received 11 consecutive Top 20 ranked recruiting classes. She is the 27th coach in NCAA history to win over 500 career games, and is currently tied as the eighth head coach in NCAA Division I basketball history to reach 800 career wins. McGraw was awarded the US Basketball Writers Association (USBWA) Coach of the Year award, the Women’s Basketball Coaches AssociationCoach of the Year and the Naismith College Coach of the Year in 2001. She was inducted into the Women’s Basketball Hall of Fame in 2011 and the Naismith Memorial Basketball Hall of Fame in 2017. In 2016, the John R Wooden award committee recognized McGraw with the 2017 Legends of Coaching Award. On April 1, 2018, McGraw achieved her 800th career victory at Notre Dame with a win over the Mississippi State Bulldogs in the National Championship game, marking her second national title with the Fighting Irish. On December 30, 2018, she notched her 900th career win against Lehigh, the team at which she began her collegiate coaching career in 1982. 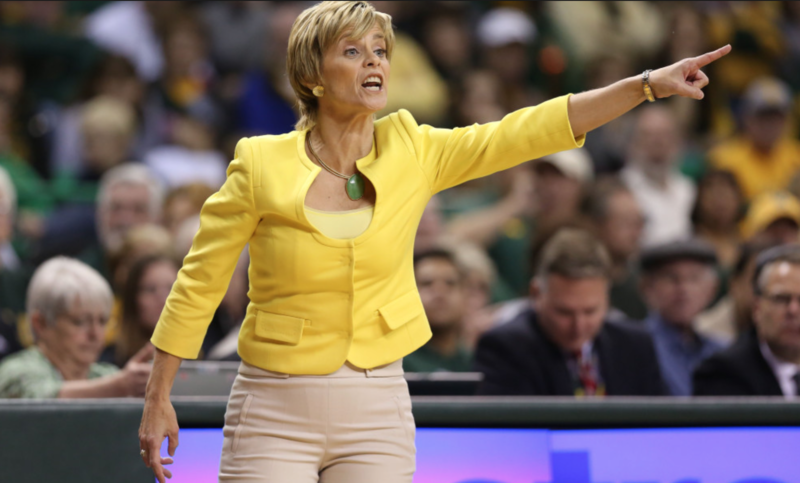 Kimberly Duane Mulkey (born May 17, 1962) is the head women’s basketball coach at Baylor University. She is the first person in NCAA history to win a basketball national championship as a player, assistant coach, and head coach. n 2000, Mulkey took over a Baylor program that had finished the 1999–2000 season 7–20 and last in the Big 12 Conference. In her first season at Baylor, she led the Lady Bears program to its first NCAA tournament bid. The Lady Bears have gone to postseason play every year since Mulkey’s arrival, including all 16 of the program’s NCAA Tournament appearances. They have won 20 games every year, and only once has the team lost more than 10 games in a season. The rise of the Baylor program under Mulkey was capped off in 2005 with a national title. This made her the first woman to have won NCAA Division I basketball titles as a player and a head coach, and only the fourth person (after Joe B. Hall, Bob Knight and Dean Smith). Since the inception of the NCAA women’s tournament in 1982, Mulkey has been involved in that tournament as a player or coach every year except 1985 and 2003. She was enshrined in the Women’s Basketball Hall of Fame in 2000 for her accomplishments as a player. Mulkey in 2007 signed a 10-year extension to remain Baylor’s coach. Her autobiography is called Won’t Back Down: Teams, Dreams and Family. In 2012, Mulkey made NCAA history by leading the Lady Bears to a perfect 40–0 season, the most wins in college basketball history, men or women. The season culminated at the NCAA Championship game in Denver, where the Lady Bears defeated Notre Dame. Mulkey is well known for her “bold” sense of fashion. She once wore a snakeskin print to a game against Connecticut; her wardrobe choices have triggered pages of discussion on fan message boards.